It's peak baking season and it's hard to avoid coming across holiday treats - especially in my office. Since I've been known to spoil my fellow co-workers with treats throughout the year, the holidays are no exception. 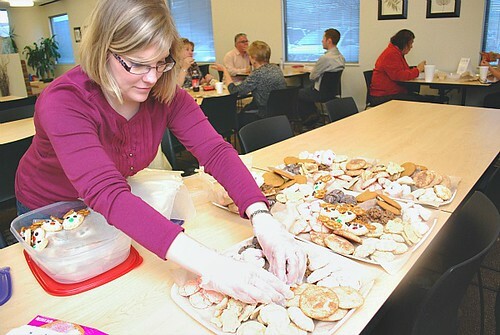 This time, I asked some of my office friends to join me in baking up cookies for a good old Holiday Cookie Swap. A handful of us came together and each brought in over 2-4 dozen cookies and treats, which we arranged on platters. 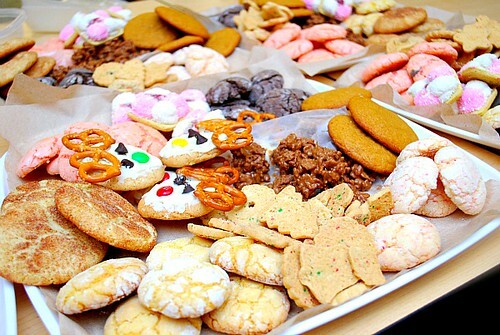 These delicious platters of cookies were then shared with the office among 5 floors in my building. Needless to say, we were quite the popular group that definitely surprised and impressed our colleagues. Our little Holiday Cookie Swap/Share was not an ordinary cookie swapping event. In fact, I told my friends that I was partnering up with the GLAD Product company (food storage containers) to donate money towards ‘Cookies for Cancer.’ The GLAD Product Company is making a special effort this holiday season in helping this non-profit organization, founded by parents inspired by their young son’s fight against cancer. Today pediatric cancer is the number one cause of death by disease of children in the U.S., due in large part to the need for funding for research into new and improved therapies. That’s why GLAD will be donating up to $1.00 to Cookies for Kids’ Cancer for each cookie exchanged or given – up to $100,000! … and I’m helping in their effort, one cookie at a time, by hosting this Holiday Cookies For Cancer Cookie Swap/Share. 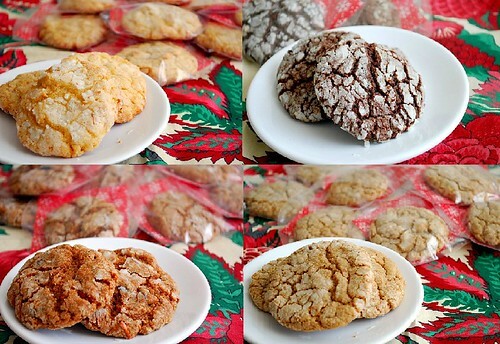 I made my Holiday favorite - Crinkle Cookies. I make them every year and this time, I made Pink Lemonade, Cherry Chip, Dark Chocolate and Lemon Crinkles. The recipe is ridiculously easy using only 4/5 ingredients - your favorite flavor of cake mix, vegetable or canola oil, 2 eggs and some powdered sugar. That's it! Check out this link for the recipe! Kathy made two kinds of cookies - Pumpkin Spice and Snickerdoodles. These were both delicious and definitely were a favorite among the floors. Lori made a non-baked cookie - Chocolate Peanut Butter Bumpies. These were made with chocolate chips, peanut butter and rice crispy cereal. With that combination, how could these be passed up?! Susan and her daughter Addyson made the most adorable cookies - Reindeer Cookies. These are perfect to make with your little ones and maybe even harder to eat since they were so cute! These were made with sugar cookie dough, some frosting and decorated with mini pretzels and M&M candies. Meghna wanted to participate but didn't have a chance to bake, so she brought in some Marshmallow Squares and Holiday Anise Cookies to share. They definitely added a nice pop of color to our cookie platters! Thanks to GLAD, our cookies helped raise $312 dollars since we brought in 13 dozen cookies! Thank you to my wonderful baking buddies for participating, my hungry colleagues in the office for helping us eat these up and most importantly to GLAD for donating $1 for each cookie we made. I have partnered with The Glad Products Company through DailyBuzz to help promote their Food Storage products. I have been compensated for my time commitment to work with this product. However, my opinions are entirely my own and I have not been paid to publish positive comments. Thank you GLAD!